Think about the need for EMI shielded ventilation panels – what they do and why you need them. 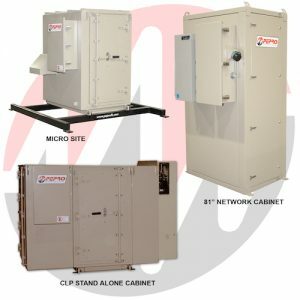 Are you fully protecting that hardened enclosure with the right option? Does it measure up to standards for your civilian or military application? Simply consider the close proximity of electrical systems and their sub-components to control and communications equipment on ships or in aircraft. Now imagine the damage that could be inflicted on neighboring operations from noise created by those systems, and vice versa. This is not unlike the reason for “airplane mode” on your smartphone. Honeycomb Waveguide Panels: These panels attenuate signals passing through ventilation openings with a series of honeycomb openings which are less than half of the height of EMI/RFI wavelengths, disrupting their flow to waveguide below cut-off. Frames are built from various materials to accommodate E-field or H-field attenuation. Because of their superior attenuation abilities they are often used in manned military shelters or vehicles, but they can also be fitted for electronics cabinets or anywhere EMI or RFI shielding is the major concern. Honeycomb Ventilation Panels: Honeycomb vent panels provide optimal EMI/RFI shielding while having minimal effect on airflow pressure. Like the honeycomb waveguide panels, they use a waveguide honeycomb design to achieve maximum EMI and RFI shielding. Honeycomb vent panels are found in a number of stock options to be quickly implemented, but it is important to consider airflow requirements, types of mountings, and the type of shielding required during selection to get the best possible attenuation for your application. Shielded Fan Ventilation Panels: These are typically used for civilian markets where low-cost and superior function needs to be accommodated. They are made from honeycomb material and are found in a number of standard sizes, or can easily be customized per specific needs, which includes the addition of fingerstock. A good use example is for telecommunications equipment or server rack configurations. For military use they can be plated with tin (MIL-T-10727) or nickel (MIL-C-26074A) or with RoHS compliant materials. Shielded Air Filter Panels: When EMI or RFI shielding concerns are minimal but dust or other particulate penetration needs to be filtered, EMI Shielded Air Filtration Panels are used. The actual filter material can be found in wet or dry versions. For really fine particle concerns they are often coated with glutinous oil. Many “off the shelf” versions and sizes exist and, having rigid frames with EMI/RFI gaskets or captive fasteners already in place, delivery and implementation is quick and easy. These, like all EMI shielded ventilation panels, can also be customized to specific applications. Ventilation panels can be a major source of failure for hardened enclosures. EMI shielding to the level necessary for your application, environment, and civilian or military use standards is the only way to seal the 2nd largest “hatch” of exposure while still maintaining adequate air flow. Fortunately, MAJR Products offers solutions for all applications and our engineers are particularly adept at offering customized solutions. See this particular page for a one-stop look at all of our EMI shielded ventilation panels.